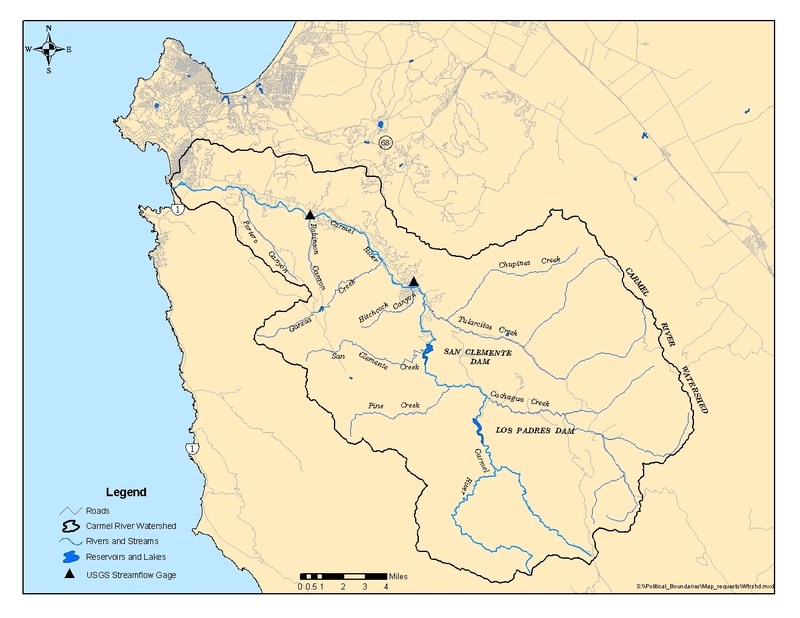 Map of the Carmel River Watershed. Image: MPWMD. Nestled between the Sierra de Salinas and Santa Lucia Mountain Ranges on the Central California Coast, the Carmel River Watershed is composed of countless small tributaries that all drain into the Carmel River, eventually forming the Carmel River Lagoon at Carmel River beach, which periodically breaches into the Pacific Ocean. The Carmel River Watershed encompasses 255 square miles in Monterey County on the Central Coast of California. The watershed drains into the Carmel River which runs through Carmel Valley and the City of Carmel before reaching the Pacific Ocean. The Santa Lucia mountains create the southern border of the watershed, and the Sierra de Salinas mountains are to the north. .
Carmel River at Schulte Bridge. The Carmel River main stem is 36 miles long. With its headwaters in the Ventana Wilderness, the upper river is characterized by steep canyons and is relatively undeveloped. The lower 16 miles of river run through moderate to highly developed areas along the alluvial valley before reaching the Carmel River Lagoon . River flow is monitored by the Monterey Peninsula Water Management District at four main stem gaging sites. The Carmel River connects to the Pacific Ocean through the Carmel River Lagoon in winter months when flows are high. In late spring and summer sediment deposits from the river, and offshore sand carried back to the beach by wave activity create a sand berm that closes the river mouth . When the return of winter storms increase lagoon inflow, the lagoon approaches its natural breach point - a level that threatens to flood nearby homes. Currently the County of Monterey addresses the issue by taking emergency action and artificially breaching the lagoon. There are concerns about the effects of artificial breaching on sensitive lagoon species, notably Steelhead Trout . In addition, artificial lagoon breaching may cause a shift in species composition of the lagoon by altering the saline content . Potential lagoon projects address flooding and erosion control, and habitat restoration methods such as the addition of anchored logs to improve steelhead habitat . The Carmel River Floodplain Restoration and Environmental Enhancement (Carmel River FREE) Project would connect the floodplain east of Highway 1 to the Carmel River lagoon. Precipitation is transported as surface water throughout the watershed via surface water and groundwater pathways. The continuous and complex interaction of groundwater and surface water pathways is determined by several factors, including geology, season, and extraction for human consumption. Annual precipitation, which falls primarily as rain, ranges from 14 inches near the river mouth to 41 inches in the Santa Lucia Mountains. Surface water in the Carmel River Watershed has several potential outflow pathways that include groudwater withdrawals, transpiration due to riparian vegetation, evaporation from the water surface, and outflow into the ocean. Despite the relatively small size of individual water extraction claims compared to the entire watershed, the sum of all the water use has caused the stream to dry up during the summer months of certain years. This overuse of water supplies pose risks to fish populations. The Carmel River Watershed is includes two aquifers: an unconfined alluvial aquifer and a combination of fractured beckrock aquifers located beneath the hills around the watershed. Although the alluvial aquifer has been thoroughly assessed, the fractured bedrock aquifers that provide water resources to large ranches and residences are not well understood. An example of the recent increase in upland fractured bedrock aquifer extraction is the San Luicia Preserve, located on the former Rancho San Carlos property. The physical structure of the watershed is primarily dictated by the regional geology, which is composed of igneous, metamorphic and sedimentary rocks. The formations are broken up by several faults with a range of ages and activity. Tectonically, the Carmel Watershed is carved into the Salinian block, which was transported north as part of the Pacific plate. The underlying geology dictates the physical characteristics of the sediment, including the erodibility and landslide potential. The steep canyons in the headwaters of the Carmel watershed are indicative of recent and sharp incision of the upland streams and tributaries. The high topographic gradient that leads to this incision is due to recent uplift of the Santa Lucia and Sierra de Salinas Ranges. These steep-sided canyons result in a high sediment yield as part of the incision. Additionally, the high gradient and rates of erosion make the terrain vulnerable to slope failure and landslides. The distribution of valleys and uplands are determined by preferential erosion of less resistive geologic materials. Soils and bedrock that has been crushed in the active Tularcitos fault zone are less resistant to erosion, and therefore create the lowlands in the Carmel River Watershed while the more resistant, intact bedrock composes the uplands and ridges. Watershed issues in the Carmel Watershed are complex and diverse, involving many stakeholders representing many conflicting uses of water. California American Water (CalAm) extracts water from wells along the river for use by the residents of the Monterey Peninsula, as described here: CalAm Use of Carmel River Groundwater Basin. CalAm is currently making illegal diversions from the Carmel River, according to California State Order 95-10, in order to meet the water demand of the community . Water supply projects incorporating a desalination plant have been proposed by CalAm and local government agencies, as well as private parties . The Monterey Peninsula Water Management District (MPWMD) has initiated Aquifer Storage and Recovery (ASR) projects to capture and store excess winter flows for use during the summer months . Another water supply issue is related to the sedimentation of the Los Padres Reservoir. When the dam was constructed, it had an estimated capacity of 3,130 acre feet. However, a recent study conducted by the CSUMB Watershed Institute measured the current capacity to be 1,785 acre feet. The San Clemente Dam was a 106-foot high concrete dam located just downstream of the convergence of the San Clemente Creek with the Carmel River owned by California American Water Company (CalAm). Built in 1921, the dam had an initial storage capacity of 1,425 acre-feet, which had been reduced to 70 acre-feet by 2008 due to siltation . The California Department of Water Resources (CDWR) Division of the Safety of Dams determined in the early 1990s that the dam could fail in a large earthquake or flood . It has been estimated that an earthquake with a magnitude of up to 7.1 could hit the Tularcitos fault system, with the system's Cachagua fault running beneath the San Clemente reservoir . Due to concerns about steelhead habitat impairment and seismic safety concerns the dam was commissioned to be removed in 2013. This initiated the Carmel River Reroute and Dam Removal (CRRDR) Project that was completed in 2016. Sediment movement in the Carmel River Watershed has been impaired by the presence of the Los Padres and San Clemente Dams. Trapping of sediment at the reservoirs has led to incised channels downstream, destabilized banks, and accelerated erosion rates . In addition, grading for urban development in the densely populated lower river valley has created unnaturally steep slopes that further increase the rate of erosion along the river banks. The majority of the watershed is considered vulnerable to erosion . Flooding in the Carmel River Watershed has caused significant damage in the past due to the heavily populated urban areas built within the 100-year flood zone . In 1995 there were over 2,720 evacuations, and 800 residences, 68 businesses, 62 roads, and 3 bridges were damaged due to a flood of approximately 16,000 cfs (estimated to be the 65-year flood)  . In 1998 a flood of 14,700 cfs flow again caused considerable damage in the Carmel River Watershed . The Monterey County Water Resources Agency provides details of historic flooding in the region dating back to 1911 here. Listed below is a brief timeline of water rights and dam operation in the Carmel River Watershed. A more exhaustive timeline is availabe at Carmel River History. 1883 The first dam on record the Carmel River is created near the current San Clemente Dam. 1921 The San Clemente Dam is completed with the purpose of providing water to the population on the Monterey Peninsula. 1939 CW&T (California Water & Telephone) distributes water resources to 7,430 customers and irrigates 5 golf courses. 1977 Monterey Peninsula Water Management District (MPWMD) created to manage, augment, and protect water resources for the benefit of the community and the environment. 1996 ESA listing (threatened status) of the red legged frog (Rana aurora draytinii). 1997 ESA listing (threatened) on steelhead trout (Oncorhynchus mykiss) on the central California Coast. 2008 California Department of Water Resources approves the Carmel River Reroute and San Clemente Dam project. 2009 The California State Water Resources Control Board issues a cease-and-desist order that directs Cal-Am to stop overpumping withing the Carmel River. ↑ MPWMD. T. Christensen and E. Geisler. 2009 Riparian Corridor Monitoring Report. ↑ Monterey County Weekly - State water board approves cease-and-desist order against Cal Am. This page may contain student work completed as part of assigned coursework. It may not be accurate. It does not necessary reflect the opinion or policy of CSUMB, its staff, or students. This page was last modified on 26 March 2019, at 14:17. This page has been accessed 130,074 times.